An autumn exchange piece I stitched for the Autumn Exchange on Needlecraft Haven (a Yuku Group) I enjoyed stitching this and thought it camve out lovely x x The recipient was really pleased. This sort of finished piece could also be made into wedding favours, if you have a small wedding. 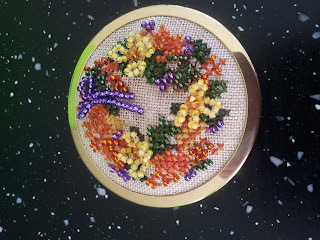 You could pick a design with the colours of your flowers and stitch for the ladies who are attending. They do not take long to stitch but would make a lovely wedding favour, if you put your names and date of wedding onto them.